Ive's Influence: Can a Great Product Designer Also Design Great UI? 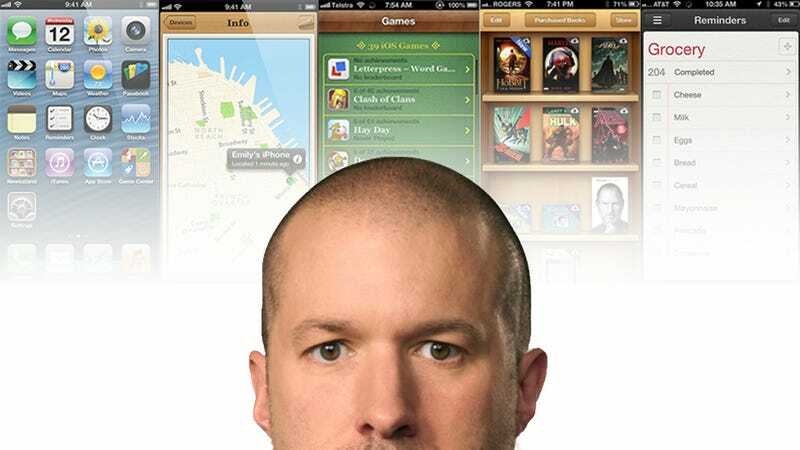 With iOS 7 a little over a week away, it's worth taking stock of the fact that this is Jonathan Ive's first WWDC as Apple's Head of Human Interface (HI). But what does it mean for an industrial designer—someone who works with atoms in three dimensions—to be put in charge of a team that works with electrons in two dimensions? At this point, no one outside of Apple knows exactly what changes are coming our way. If Tim Cook's recent comments are any indication, though, Ive's effect on the look and feel of iPhone and iPad software has been both immediate and profound. Whatever the changes, getting to them must have been an extraordinary challenge. The one constant across all design disciplines is process. Sure, every project is different. But they all have the same basic rhythm: a problem is presented, you learn as much about the problem as you can, you come up with a bunch of ideas based on what you learned and your own intuition, those ideas are refined and condensed down until you have a chosen direction, and then you go into production. There are a million things that happen in between, but that's the basic gist. So even though ID and UI work with different tools and have different outputs, the design process is essentially the same. In this regard, Ive and his UI team should be on completely even footing. Beyond that it gets a bit more nuanced. Ive’s newcomer status to UI is both his biggest liability and strength. It’s a liability in the sense his team will be teaching him just as much as he’ll be guiding them. He will likely want to take more time understanding the ramifications of decisions that he would normally make very quickly in an industrial design setting. That could slow things down a bit. Some of the things he will suggest will undoubtedly be things that every first-year UI student has tried. He’ll likely ask for things that aren’t even possible yet, and be surprised by what tools are available right now. That's exactly why being new is also his biggest strength. Not knowing the "right" way to do things means you're not burdened by the same rules. He'll be able to challenge assumptions held by his team and propose things they wouldn't have thought about. Going slower is probably not be the worst thing in the world, either. Making serious changes to the workflow of an operating system that is as widely used as iOS isn't something that even an experienced UI designer would take lightly. Most of the work done by any designer—either industrial, graphic, or architectural—is focused on designing what you can't see. For industrial designers that means working in three dimensions. The nature of working in 3D is that you never see the whole object all at once. The screen you are looking at has a back. And sides. And buttons. And ports. Maybe a stand. Maybe it fits in your hand. Maybe it sits on a table. It has internal components, and external components which support interaction. But those are just a few of the things you know you can’t see. What about the aspects of a project that you don’t know you can’t see? The things you feel might be important, though you can’t explain why. Being able to solve issues that defy articulation—at least at first—is often where the real breakthroughs happen. The ability to resolve both the unseen and the seen, for what is known and what can only be intuited or anticipated, is in fact designing the user experience. Apple and Ive are often fond of describing this process as focusing on how design works, rather than how it looks. It can take years for a designer to build a reflexive sense of the unseen functionality of a product—without even beginning to talk about aesthetics, materials, or production. Ive has spent decades refining and testing those instincts—and though he might be used to working in 3D, it’s likely that those instincts will hold up across the shift in dimensions. So does having a background in industrial design mean Ive will approach UI differently than a user interface designer? However, it will take time to approach the level of understanding—to intuit the parts of a design he can't see—that someone of his stature in the UI world has had time to develop. In fact, he might never reach that stature. But that's not critical. Ive is working with some of the best UI designers on the planet. He probably won't be sitting at a laptop, cranking away on an icon. Having a background in any design discipline is a sturdy jumping-off point. What is critical? That he has the taste to discern what’s world class, that he gets his team to perform at that level, and that he continues to approach the work by trying to understand those aspects of a product that the user doesn’t see—but rather what the user thinks, feels, and experiences.